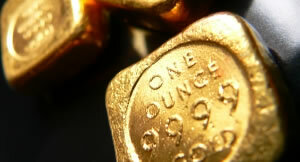 Gold advanced for a second day Wednesday, gaining safe-haven support from GDP data showing that the U.S. economy shrank in the fourth quarter of 2012 for the first time in more than three years. Gold futures for April delivery — the new, most active contract — settled up $18.90, or 1.1%, to $1,681.60 an ounce on the Comex in New York. Gold prices traded between $1,663.50 and $1,684.00. "Clearly with the negative GDP, we’re seeing a flight to safety," Tim Evans, the chief market strategist at Long Leaf Trading Group in Chicago, said in a telephone interview relayed on Bloomberg. "Growth has been fairly stable in recent quarters, but if we see more numbers like this, gold is going to have a good run." The gross domestic product contracted at an annual rate of 0.1% from October to December after growing 3.1% in the third quarter, the U.S. Commerce Department said Wednesday. The decline was the first since the April to June period in 2009. Silver led percentage gains in precious metals Wednesday. Silver for March delivery surged 99.3 cents, or 3.2%, to $32.177 an ounce, ranging from $31.25 to $32.19. April Platinum rose $10.40, or 0.6%, to $1,689.30 an ounce, trading between $1,678.70 and $1,693.60. Palladium for March delivery edged up $1.65, or 0.2%, to $751.40 an ounce, ranging from $744.80 to $760.50. U.S. Mint distributors ordered 10,000 ounces of American Eagle gold coins and 41,500 ounces of Olympic America the Beautiful Five Ounce Silver Bullion Coins. These gains are on the heels of several bullion coin milestones reached on Tuesday. Since the U.S. Mint is now rationing its supplies of American Eagle silver coins, the flat reading noted today is not necessarily indicative of current buying desires. The latest daily and year-to-date bullion coin sales figures follow.